We knew it was her destiny. The Sheevs is just too much of a daredevil to escape it forever. The cone was in her future; it was just a matter of time. I am sure it will be a funny story one day. Just not today. Poor little puppy. ← Blogging for Blogging’s Sake is Still Blogging. Or Something. I’ve got my sad pouty face on Poor Shiva looks sad. But I’m thinking a small price to pay for being I’ve and okay. Two weeks really isn’t that long sweetie. Take the time to heal. Love you! Alive. God I hate autocorrect. Poor girl. Sending hugs (((Siva))). Hope she is soon ok.
Oh no! Not the cone! Poor Shiva. Hope she’s ok. Love that silly girl. O no – hope she’s ok! Uh-oh, hope Shiva has a speedy recovery! Awwww, poor pups, Heal fast. I hope she’s up her adventures again soon (safely). I hope Shiva feels better soon. 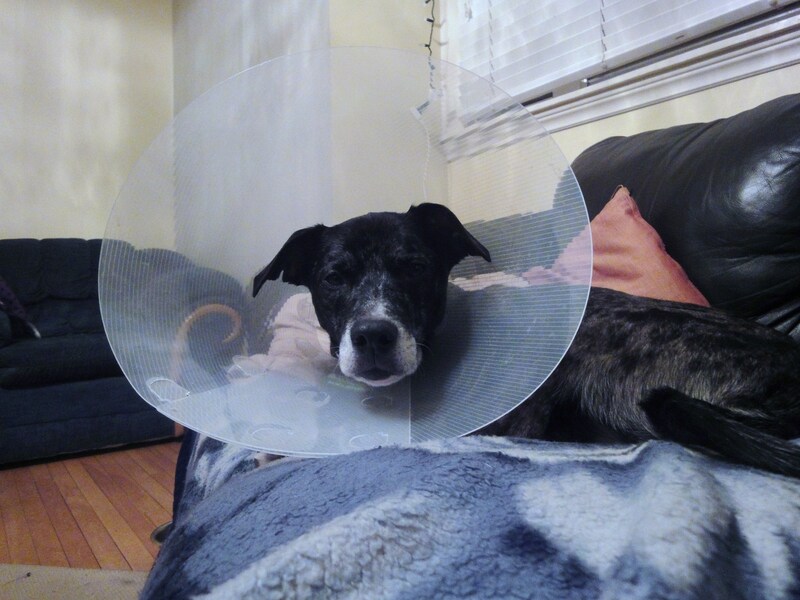 And I hope she doesn’t mind the cone as much as Ike did. He couldn’t feel comfortable wearing it. We finally played Through a Dog’s Ear for him and it calmed him right down. Hang in there Shiva. Poor Shiva. She doesn’t look like she feels comfortable enough to appreciate that she looks as pretty in a cone as without one. Feel better soon, sweet girl. Wondering what happened? Well, we sometimes need cones for all kinds of issues. Simple bug bite will cause my dogs to chew until they get the skin infected. We use the softer cones, as I hate the heavy bucket type plastic ones. Just now I have 3 adopted-rescue GSD+they want to be under my feet all the time. If they have the cone on it rams into my legs+actually hurts! I also have the inflatable blue ones + they have been great as my dogs can use them as a pillow to sleep on also! None of the dogs love being coned!!! Its as if they see themselves as less than pretty! Oh, man. 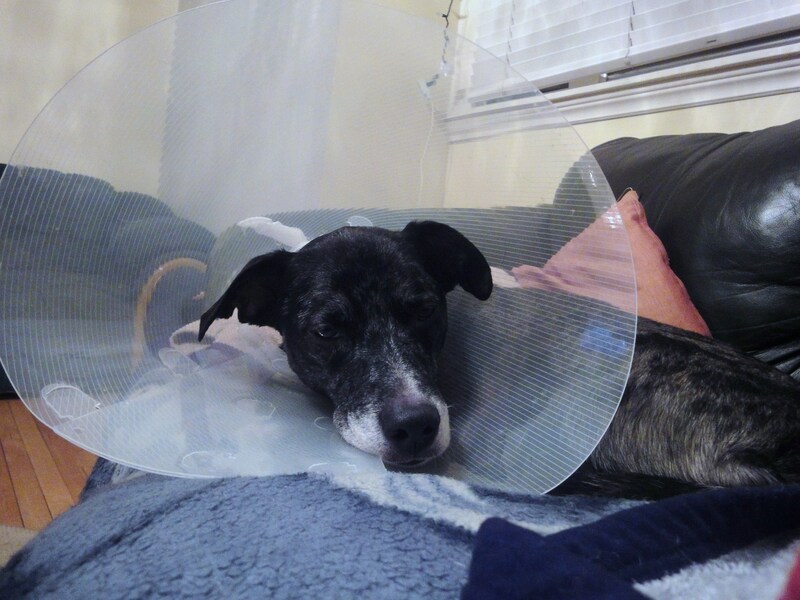 The cone is no fun at all. She looks so sad. 😦 Feel better, Shiva!